The Eastern market is located nearby the Zhuo Shui River. At the time of Qing dynasty, travelling merchants and trade caravans who reached this place started to trade and form a small town in nowadays rear part of the Eastern market nighbourhood, which was later enlarged until Yanping Road. After 1937 Xiluo started an implementig plan for the downtown, the trade developed and the population gathered over there. The Eastern market area and the one near the theatre compounded the most fluorishing part of the city centre: clothing, food, housing and transport brought the enjoyment of having everything that one could wish for. This was the source of Xiluo’s cultural development. Moreover, at that time Xiluo was a town with a good reputation in the center of Taiwan. 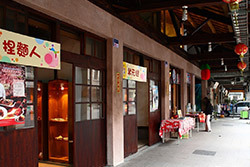 However, after the Xiluo bridge was opend to traffic in 1953, as it was built right after the intersection of Jianxing road and Yanping road, the importance of the town grew, the Central market rose and the circle of the economic life slowly moved to the west. For this reason the Eastern market, which once was used to lead Xiluo’s eonomy, gradually lost its commercial opportunities and people started to move out. With each passing day the market declined more and more and merchants left one after another. In addition, as time passed, many buildings were critically damaged. So, at that time the market could not measure up to the glorious scene of the Japanese Shawa period. In 2009 the Eastern market was successfully renovated and people who had any skill in traditional craft, street musicians etc. gradually went back and started to give shape to a traditional small town.